WHAT IS A NEST RENTAL? Nest renting occurs when a player sends a breeding pair of dragons to another player for the purpose of having the pair nested on one of the second player’s nests. This is usually done so that the hatchlings will be born with eyes that better match their colors than the owner’s own flight would, but nest rentals can also be done for lore purposes. HOW DO I RENT A NEST? First of all, this service is open to any player that wishes to use it; no membership is required. To rent a nest, please follow the steps below. are the players who are willing to rent their nests out to other players using this service, usually for a small fee. The fee for a nest rental can be seen beside each host's username on the list of nest hosts. Once you have chosen the player(s) that you would like to rent a nest from, ping them in a reply to this thread and then wait for a reply. If you have not received a reply from a host within 24 hours, you are then welcomed to ping the players from the "backup list" to see if one of them has a nest available. (1) Add your username to both dragons’ bios. (2) Feed both of your dragons so that they have 100% energy. (3) Use the “Assay Bloodlines” tool in the scrying workshop to make sure your dragons are not related before sending them to a nest host. Failure to complete these requirements may result in your CR becoming delayed or even denied by the nest host. Now, after all of the above steps have been completed, you should attach your pair of dragons and the rental fee to a CR and send it to the nest host. Please note that if your nest host requires food as payment, it is expected that you will send a food type that can be eaten by the breed(s) of dragons that you are sending to them, unless instructed otherwise. Once six days have passed, you should receive a one-way CR that includes all of your adult dragons and new hatchlings. You will need to take all of your dragons back from the nest host within seven days past the host sending the return CR. If any of your dragons are not picked up within this timeframe, they become the property of the nest host and can be sold, edited, exalted, etc. Although it is not a requirement, we do appreciate tips! You can send the nest host a tip along with your pair of dragons, or alternatively after the rental has completed. Tips do not have to be in the form of treasure. Familiars, apparel, food, Baldwin materials, etc. are all welcome. We just ask that you do not use dragons, hatchery/shop discounts, or art as a tip. Please make use of this complaint form if you have any trouble at all out of a nest host or a nest renter. Any player whom accumulates three complaints against them will be removed from the nest rental service. Click here to go to the complaint form. Complaint form submissions are confidential and no identifying information will ever be released to the offending party at any time. !! PLEASE READ THE STEPS ABOVE ENTITLED "HOW DO I RENT A NEST?" FOR IMPORTANT RENTAL REQUIREMENTS !! The users on this backup list should only be pinged if it has been a full 24 hours since you have pinged the above list and have received no response. Interested in becoming a nest host? Your account must be a minimum of 30 days old. NO EXCEPTIONS! You must have some unoccupied lair slots, the more the better. » What is expected of me as a nest host? That you should be an active Flight Rising player who logs into the site often. You should be active enough to be able to respond to an activity check ping by absinthy within a week's time. These can occur as often as once every two months. 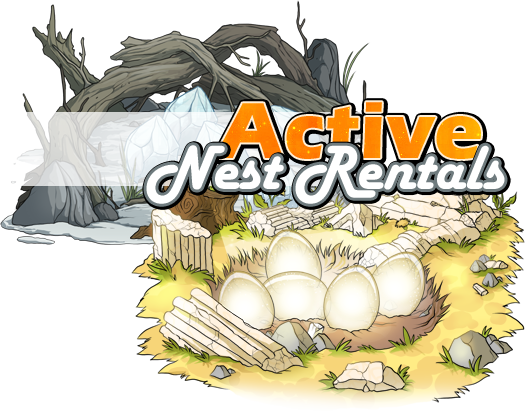 You should incubate a renter's eggs daily after accepting a rental request. You should return the renter's dragons in a timely manner. You should remain courteous to renters at all times. Hosts should not rename, exalt, sell, transfer, or otherwise edit a renter's dragons while in their care. Pings will be ignored, no exceptions! CURRENTLY NOT ACCEPTING ANY APPLICATIONS. CHECK BACK LATER. Are you applying for the main list or the backup list for your flight? How many unoccupied lair slots do you have at this time? Is your account more than 30 days old? From the list above, what is one thing that is expected of you as a nest host? No current opening within your flight? Click the link below to add yourself to our ping list document in order to receive a ping whenever a position within your flight becomes available. What is one thing expected from a nest host? one thing expected is that you are online every day to incubate the nests. What is one thing expected from a nest host? You've both been added to the nest of available nest hosts!